The statement went on to say that “David Kirkpatrick will move forward as CEO and chairman’’ of Rock Entertainment. His profile was to be removed from the Plymouth Rock Studios website by the end of yesterday. He had been recently listed as contributor, rather than as one of the team. Bill Wynne and Joe DiLorenzo will continue as Plymouth Rock Studios’ chief executive officer and chief operations officer, with their headquarters in the clubhouse of the Waverly Oaks golf course. Phase I of the studio project, which includes office space and sound stages, will be built on a 50-acre corner of the property. Waverly’s 18-hole golf course will coexist with the studio facility. DiLorenzo is anxious to move forward. “The studio project has always been about bricks and mortar, and we need to focus on getting the thing built,’’ he said of Plymouth Rock’s mission yesterday. DiLorenzo said capital markets are opening up, so he believes it will be easier to secure financial backing. No announcements regarding project finances will be made until the deal is solid, DiLorenzo said. Last November, the company announced it had secured $500 million in backing, only to have it fall through. Wynne remains confident studio construction will start by the end of the calendar year. Phase I should be ready to open in 2012. Much of the space has been preleased. 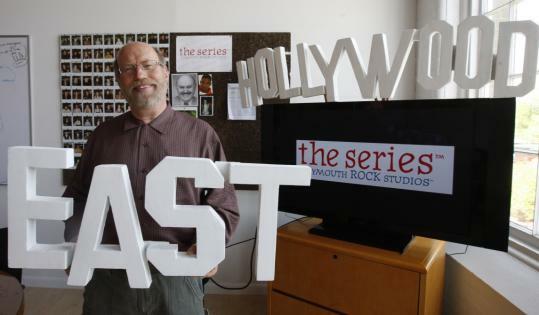 Kirkpatrick, meanwhile, is venturing off in his own direction, to continue working on the Hollywood East TV YouTube site for video sharing. Kirkpatrick said yesterday’s announced split merely formalized a division that had been made between the real estate team and the creative members of the venture. But Kirkpatrick conceded that Plymouth Rock Studios’ mission was no longer the same as it had originally been, when the building facility and the creative efforts were intertwined. In an e-mail, Kirkpatrick wished Plymouth Rock Studios “the best of fortune,’’ adding that both sides maintain good relationships.